Thailand's tourism industry has come a long hostory since it started with the Royal Retreat at Hua Hin southwest of Bangkok and Chiang Mai in the North. In the late 60's and early 70's Pattaya emerged as Asia's most popular beach destination. Then Phuket appeared on the tourism map in the late 70's. Samui Island joined the growing list of destinations. Meanwhile Bangkok, Ayutthaya and Sukhothai grew more popular for their historical attractions. 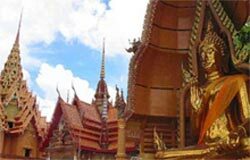 The most practical way to explore Thailand is to join a tour, where you get to visit the best attractions in a day or two without any hassle. We offer extensive information on sightseeing tours, excursions, cooking class, adventure tours, walks and guide services. Make the most of your vacation time and experience unforgettable Thailand. Thailand is an extraordinary country of contrasts and surprises with glittering temples, tropical forests, idyllic beaches, modern shopping malls and friendly hospitable people. From the high mountains in the north, to the soft sand beaches in the south, the scenery will take your breath away. Jungle covered mountains, deep mist covered valleys, island seascapes, beaches and coral reefs, all part of Thailand’s rich tapestry. And, it’s easy to get around. Add a vibrant capital city, bustling with activity with a modern sophisticated “Skytrain” rail system and superb hotels and you have a unique holiday experience. Ranked among the world's most popular destinations, Thailand is a breathtaking paradise not to be missed. Blessed with a diverse variety, this ancient mystical land has it all palm studded white sand beaches, forested mountains cloaked in dawn mists, well preserved ruins of historic civilisations, not to mention the excitement of Bangkok's modern metropolis. Whatever the age, infants to juniors, teens to adults, parents to seniors, the spectacular Kingdom will leave everybody with a suitcase bulging full of happy memories and a bounty of thrilling adventures! Perfect sunny days and clear moonlit evenings can be as action packed or laid back as you desire: in Thailand it is easy to create a tour to please all tastes and lifestyles. While Thailand's pleasant year round climate, arresting scenery and remarkable architecture are deservedly famous, its welcoming people and rich culture are equally fascinating. You will gain an invaluable and educational insight into the breadth of Asian life as it arouses the senses with a fabulous wealth of traditional customs, cuisine, music, dance and art. Far from an inconvenience, you will experience sight and sensations that most seasoned travellers only dream about touching. More active travellers will soon be exhausted by the limitless and awesome selection of leisure and adventure pursuits. Cheering ringside at the physical thrills of classic martial art of Muai Thai will leave you breathless. Tee-off on a lush tropical fairway at the numerous internationally designed golf courses, or be soothingly pampered within the ambient setting of a sumptuous spa. Submerge to the deep as you snorkel over colourful coral reefs swarming with vibrant sea life.